Blyth’s last game of the season at Bates Cottages ended in defeat. In a 30-over game with the delayed start, Blyth won the toss and put the home side in. Blyth thought they had made an early breakthrough when Quinn stumped Golightley, but the decision went in the batsmen’s favour. Both David Ebdale and Silva failed to get much movement with the damp ball as the batsmen found the boundary with ease. Bates openers Golightley and Turnbull brought up the 50 partnership in the 11th over. Ebdale. The score had moved on to 66 when Golightley mistimed a shot and skied a catch to Carr off the bowling of Mark Lawrence. He scored 34 from 38 balls including seven fours. This brought the league’s leading run scorer Ross Symington to the wicket. With the score on 79 the rain returned and after an early tea, play resumed an hour and half later. The score had moved on to 92 when Dent had Symington stumped by Quinn for 17. Turnbull was still pluging away at the other end playing a controlled innings. Collins came in and hit a quick 16 from 12 balls before Carr took another catch, this time off Dent. Elliott came in and with Turnbull added 20 runs, in which time Turnbull reached his 50 from 65 balls including six fours. With the score on 140, Turnbull hit a straight drive for an easy single when a shout from a player on the sidelines shouted to push for two, Elliott set off for a second and was run out for ten. Fenick came in and went after two balls, bowled by Ebdale without scoring. Wood came in next and went first ball stumped by Quinn off Dent. Doyle came in next and saw out the final over. Turnbull finished on 59 not out and Doyle remained five not out. Blyth’s bowling figures were Ebdale 1-30, R S Silva 0-30, Lawrence 1 -35 and Dent 3-50. A steady start to the reply ended when Cragg had Dent caught on the boundary by Symington for 11 with the score on 23. Smith was next in but was bowled off his elbow for two by Cragg. Hudspith came in to join Carr and the pair looked like getting Blyth back on track with a 36-run stand. However, Merryweather had Carr stumped by Turnbull for 35 including four fours and a six. 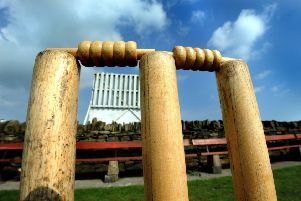 Blyth then lost four wickets with the score on 88. Symington took two in his third over when he had Hudspith caught by Wood for ten, and then three balls later he bowled Purma without scoring. Then Wood, in his final over after Lawrence had hit 11 of his previous one, tried to smack him again but Collins took the catch at deep mid-on for 24. Wood then sent new batsman Kirkup back first ball. Quinn and Roberts added six more before the latter became Symington’s third wicket when Cragg caught him at deep mid-off for three. Quinn went two runs later, run out for four and Ebdale was last out when he was caught by Golightley off Elliott without scoring. Bates’ bowling figures were Wood 2-35, Cragg 2-18, Merryweather 1-31, Symington 3-10 and Elliott 1-1. Blyth’s second XI game at home against Bates seconds was called off due to the waterlogged wicket.